Whether you’re fresh out of college and used to trekking around campus or you’re leaving a job that requires you to be active, adjusting to a sedentary, nine-to-five job can be really difficult. 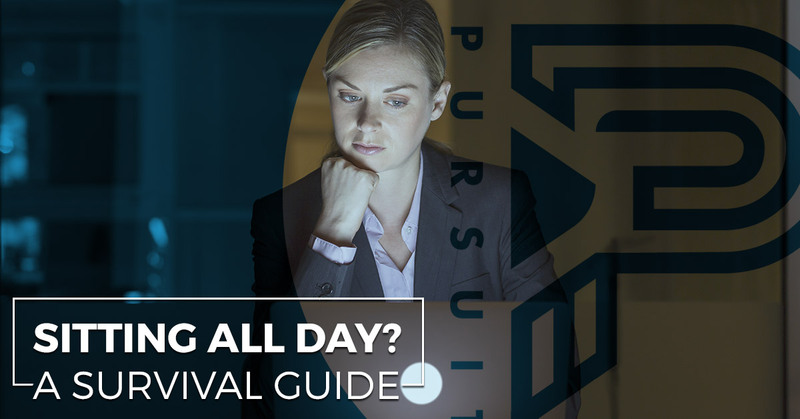 Many work places try to bring natural light and beneficial elements in, but getting trapped at a desk for eight hours every day can feel like a legitimate threat to your sanity, especially if you depend on activity to keep you on an even keel. At Pursuit, we understand that a majority of people don’t have a choice when it comes to the sedentary nature of their work. We also know that sitting for long periods of time can have catastrophic effects on your health. That is why we actually encourage people to be dissatisfied with sedentary habits. You should feel bothered by having to sit for hours on end: it isn’t actually good for your body. There are things you can do to inject a bit of sanity into your desk or cubicle, and today, we are going to share five of them. If you’re tired of sitting still all day, you aren’t alone. Studies have shown that sitting all day is worse than smoking, and even though chairs are more ergonomic these days, they still cause leg, back and shoulder pain. We recommend you invest in a stability ball. They come in different sizes and are really cheap. You’ll release pressure on your back and build core strength while you’re working. You can also use the ball to do crunches and balance exercises when you get restless. We understand that your schedule can be hectic enough that you can barely step away from your desk to go to the bathroom, much less take a walk. However, your employer is required by law to give you two 10-minute breaks and a lunch break. Fight for these breaks. When you take them, get away from your desk. Walk around and enjoy the refreshment you feel from getting moving. If you have trouble with motivation, invest in a step counter and get moving! If you work in a noisy location, a good pair of headphones can be a true lifeline. Most workplaces have no trouble with headphones, which not only keep extra noise from your ears, but also signal to your peers when you’re getting down to business and aren’t available to chat. Invest in a subscription to a streaming service and stream music that helps you focus. Studies have shown that we all do better when we keep a little connection to the outdoors. Even if it’s just a picture, it can make a huge difference. We recommend you invest in a plant or two to keep at your desk. The green will help your brain, and the plant itself can clean the air and take in carbon dioxide. If you don’t have a green thumb, bamboo is a great, tough plant that will give you that glimpse of green while staying alive despite few waterings. Staying active outside of work will make the hours at your desk far easier. When you join our Windsor fitness gym, we will have a place you can come to work out all the frustrations of the day and set yourself up for success tomorrow. Contact us to learn more about our revolutionary program today!